Over the last few weeks I’ve written several posts that either touch or focus squarely on firearms. There are a couple of reasons for this, neither of which start with firearm fanaticism. The first reason is that, in response to the latest round of anti-liberty, anti-firearm rhetoric and legislation, I began writing a post that included points and perspectives that I felt were important, but largely absent from public debate. Or, more accurately, absent from publicly allowed debate. And probably publicly funded debate as well. These ideas were semi-related but had their own nuances, and as the original post got out of hand I stripped out each distinct thought and put it in its own post. I am relatively new at this blogging thing, and nobody told me about how the intention to write one post can turn into half a dozen posts that take weeks to write. The second reason for this series of posts was the driver behind the original post I started: I believe that maximum individual liberty – and all the imperfection it allows – offers the path to becoming our best selves, and as a result, the best society. 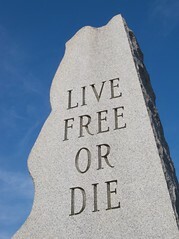 I wish that there was some way to guarantee we’d always and forever be safe and free, but there isn’t. Not even with firearms. It’s just that when our right to self-defense hasn’t been hobbled or removed, we – individually and collectively – dramatically decrease our odds of being victimized. The last post in the series will go out tomorrow morning. I think it’s the original seed that spawned all the related posts, but everything kind of runs together so I’m not sure. It’s not the end-all, be-all, but honestly I think it’s the most important point in the whole debate. Now I can get back to my original focus: going where I can live a freer life, and working to make it more free.